Without LeBron James, the Cleveland Cavaliers turned to Kyrie Irving to lead them, resulting in the best scoring performance of his career or anyone else in the NBA this season, scoring 55 points to lead them against the Portland Trail Blazers in a 99-94 win, all done without an injured LeBron James. 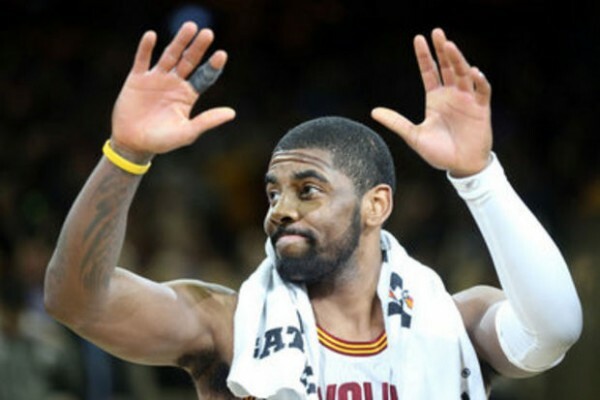 Irving made 11 three-pointers, one shy of matching the NBA record, finishing the game with 11-of-19 from beyond the arc and 17-of-36 from the field. He was perfect from the free throw line (10-of-10) and the definition of clutch as the Cavaliers climbed back from a 3-point deficit mostly thanks to his scoring, either from long range or from the line. Timofey Mozgov helped out with two free throws but like most of the game, it was the Irving show in the closing minutes as well. Of all his field goals, nothing was bigger than his two 3-pointers in the final 1:15 of the game. The first one tied it a 92-92, and the second one with less than seven seconds on the clock put the Cavaliers up by three points after LaMarcus Aldridge tied the game at 94-94 twenty seconds earlier. This wasn’t exactly a brilliant display of vintage team basketball or moving the ball; more of a one-man show, but that’s part of the privilege when you put together so many talented players. Aside from Irving, there wasn’t a lot to be happy or proud about. Kevin Love shot just 3-of-15 from the field as the Cavs improved to 2-8 this season when James isn’t playing. J.R. Smith, who attributed his success with the Cavs to the lack of nightlife in Cleveland compared to New York, scored 11 points on 5-of-12 from the field, surprisingly not trying to outdo someone on a very rare shooting night. Timofey Mozgov scored 12 points, having a double double, just like Love. Irving wasn’t the only player to put on quite an impressive individual show. Damian Lillard couldn’t keep up with just 4-of-19 from the field and 14 points, witnessing the kind of defense a focused effort can get out of Irving as well, but LaMarcus Aldridge in his second game since electing not to have surgery on this thumb scored 38 points and didn’t look like anyone who is having some kind of trouble playing dominant basketball right now. This wasn’t just a career high for Irving or the highest scoring game for anyone this season. It’s the highest scoring game for any NBA player since March of 2014, when LeBron James poured 61 points down on the Charlotte Hornets, then Bobcats. An interesting tidbit about Charlotte is that the previous three games of players scoring 55 points or more came against them. This is the first time since 2007 anyone has scored 55 points or more against the Blazers. Kobe Bryant with 65 was the one to do it back then. Another interesting fact about Irving’s 55? It’s only the second time that a 50-point game has happened in Cleveland. LeBron James’ 8 games for the Cavs that reached 50 or went past all happened on the road. The previous 50-point game on a Cleveland basketball court? Walt Wesley in 1971, scoring 50 against the Cincinnati Royals. James scoring 55 points against the Bucks in 2009 was the last time a Cavaliers player hit 55 or better.